Designed for audio/video applications, such as a home theater installation or a multi-room A/V hookup. The key to this RapidRun™ is our proprietary MUVI (Multi-Use Versatile Interconnect) connector design which features a locking mechanism that connects to either a Break-Away™ Flying Lead or Wall Plate. The MUVI connector also enables you to pull the Runner™ base cable through a 3/4in conduit then terminate with your flying lead or wall plate. 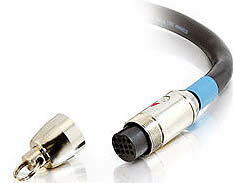 • Constructed from (5) 28AWG 75Ohm mini coaxial cables. 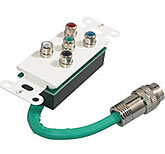 Each complete RapidRun solution requires a Break-Away or Wall Plate on either end of the Runner cable. For each Runner you will need (2) Break-Aways, (2) Wall Plates, OR (1) Break-Away and (1) Wall Plate. RapidRun's™ revolutionary design provides the greatest flexibility and ease of installation without loss of signal quality. Two styles of Runner™ base cables, a 3-Coax with 4 twisted pairs and a 5-coax version, allow this unique interconnect system to be configured for UXGA, Component, Composite and/or Digital/Analog Audio Signals.